Custom homes allow you to make the decisions and create a home that will fulfill all your needs in Huntersville. For most people, investing in a new home is one of the largest purchases they will ever make. Owning a home comes with many benefits, but it’s not always easy to find the perfect space for your family. If you’re shopping for real estate and can’t seem to find exactly what you’re looking for, consider another option: building a custom home. 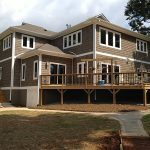 Custom homes are built to exact specifications provided by you, which means you don’t have to sacrifice on the functional and layout aspects that are so important. Choosing to buy an already-built home may have some advantages, but you’re fairly limited in what can be done to customize it for your family’s needs. For example, maybe you want an open floor plan, but the walls within the space are load-bearing, so they can’t be taken down without causing issues with the structural integrity. Even when renovations are feasible, the cost to completely overhaul major sections of a home can be prohibitive. You still might not get exactly what you want, even when the dust has settled. Custom homes allow you to make the decisions and create a home that will fulfill all your needs. Here in Huntersville, North Carolina, our team at Chad Goodin Signature Homes offers construction of custom homes. We’ll start by working with you to figure out exactly what you want in your new home. From there, we can create a functional and beautiful design that will include the space you need, along with a layout that flows nicely. We also offer high-end finishes to add a touch of luxury to your new home. At Chad Goodin Signature Homes, we can build beautiful custom homes in Huntersville, Mooresville, Cornelius, Davidson, and the surrounding Lake Norman area of North Carolina.